The largest minority in Europe without autonomy are the ethnic Hungarians of Transylvania. The states of Central-Europe evolved from the detritus of four major empires, the Russian, the Ottoman, the German, and the Austro-Hungarian. Major wars destroyed each of them but in their footprints the resident ethnicities, buoyed by the possibility of the establishment of ethnic nation-states, convinced the major powers that they too, should have the right to govern. Boundaries of newly created entities were drawn by the victors in two world wars based on their perceived needs in case of armed struggle in the future. The wishes of the minorities, including the use of the minority languages in official capacity and in the educational setting was not considered. Transylvania, for over a millennium, was culturally and in various forms, an integral part of Hungary or was administered by Hungarians. The Treaty of Trianon of 1920 transferred Transylvania to Romania without a plebiscite. The new rulers instituted laws and regulations to assimilate the large minority populations of the acquired territory with the intent of creating a unitary state. One hundred years later, this aim was not realized and was made more difficult with the requirement of adherence to European Union norms. Primary tools for assimilation and the creation of the unitary state concept rely on the restriction of the freedom of speech, refusal of the restitution of previously illegally seized minority property, barriers to higher education in minority tongues and hindering activities that remind minorities of their ethnicity. The voiced discontent of minorities is expressed in these issues. 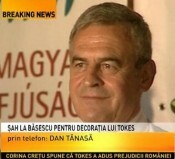 Romanian law permits bilingual street signs where minorities make up at least 20 percent of the population. In many localities where bilingual street signs have been displayed, many are damaged and spray painted. The police have not been active in apprehending the perpetrators. Recently in Miercurea Ciuc (Csikszereda) where 81.39 percent of the inhabitants are ethnic Hungarians, a lawsuit was filed by outsiders because the Hungarian name appears above the Romanian one on street signs. In 2004, the Szekler National Council (SNC) created an emblem for the Szeklers of Transylvania, the descendants of the original Hungarian settlers. On a light blue background with a horizontal gold bar in the middle and an eight pronged gold star representing the eight Szekler regional jurisdictions and with the crescent moon next to it symbolizing the Szekler belief of a better future. The symbolism is derived from a 1659 seal of the National Assembly of Transylvania. It immediately became popular and was made into flags that were widely displayed at Szekler gatherings, memorials and townships where the minority is prominent. Almost immediately the authorities, through new regulations, tried to curtail and limit its display. Lawsuits were filed against individuals and localities where the flag was displayed, even claiming that the flag constitutes commercial advertisement. The display of the flag on the balcony in Oradea (Nagyvarad) of the office of Laszlo Tokes, member of the European Parliament, was found to be objectionable. Several legal processes are ongoing, including one from Targu Secuiesec (Kezdivasarhely) whose population, according to the 2011 census, was 91 percent ethnic Hungarian. Counties and towns in Transylvania have their own emblems, and proposed changes in emblems generate new controversies. For example, in Sfantu Gheorghe (Sepsiszentgyorgy) where large number of ethnic Hungarians live (77 percent of the inhabitants), the proposed changes to its emblem was rejected because it contained no reference to Dacians, a Thracian tribe that resided primarily east of the Carpathians and west of the Black Sea around the 1st century BC. There were some Dacian settlements inside the Carpathians. Since Dacia did not have a written language, reliance is on Roman accounts that describe its destruction and subsequent colonization. Relevance to Transylvania of today is far-fetched at best. The existence and viability of minority institutions and churches depend on the access to and use of properties that they traditionally possess and the income that these guarantee. According to the Hungarian Reformed (Calvinist) Church less than half of its illegally seized properties have been returned. The Greek Catholic Church was abolished by the communists and its property seized. The Roman Catholic Church depended on the income from its agricultural properties used to operate its schools. Nationalization after 1920 and the confiscation by the communist regime after 1945 put all churches into dire financial condition. After the regime change in 1989, the Reformed Church, for example, asked for the return of the Szekely Miko college, that it founded in 1859, financed and used until its confiscation by the communists. A successful lawsuit resulted in the restitution of the extensive facility but subsequently the Romanian authorities renationalized it and convicted those on the state commission who decided on the return to its original owners. Lawsuits followed, cases are currently pending in European Union and Romanian courts. Csaba K. Zoltani for the American Hungarian Federation. AHF's International Relations Committee is proud to announce that, consistent with and in furtherance of its continuing and long-standing tradition and mission, AHF launched a new initiative -- quarterly, brief updates relating to the Hungarian minority in Transylvania.